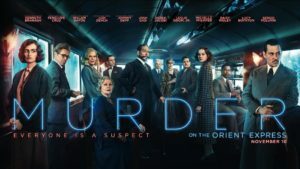 Murder on the Orient Express is based on the classic mystery novel by Agatha Christie that was written in 1934; it certainly could be the most notable or familiar mystery novel in the world. Belgian detective Hercule Poirot (Kenneth Branagh) is on board during the crime and begins his detective work by interrogating thirteen passengers or so that he deems as suspects. He is somewhat under the gun, as the likelihood of the murderer striking again is a real possibility. The premise is similar to the board game clue in which clues are sorted out; eliminations are made as red flags become brighter in pointing to the criminal. The original book has been adapted many times, most notably by director Sidney Lumet in 1974’s Murder on the Orient Express film, (Ingrid Bergman won the Best Supporting Actress Oscar, and Albert Finney was a Best Actor nominee). In 1989 the Agatha Christie’s Poirot television series had a long run with David Suchet as the detective in 13 series and 70 episodes. Agatha Christie’s Poirot: “Murder on the Orient Express” (2010), was welcomed with great reviews. So do we really need a re-make of this film? I’d say, why not—especially after viewing the elegantly stylish cinematography and spot-on set design—with a spectacular all-star cast. Wouldn’t you go and see a movie that has an all-star cast with Johnny Depp, Michelle Pfeiffer, Willem Dafoe, Penélope Cruz, Kenneth Branagh, Leslie Odom Jr. , Judi Dench, Daisy Ridley and Josh Gad costumed in lavish period pieces aboard the enticing Orient Express?